Let me first start out by saying that I have long been a skeptic of the assertion that RSI is a condition solely controlled by the mind. I can attest to the fact that it’s certainly not just imaginary pain. 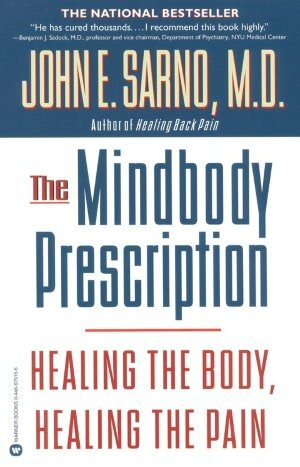 So it was with a somewhat critical eye that I started reading the book, ‘The Mindbody Prescription’ by Dr John E. Sarno. The book has been available for a while, from 1998, but is nonetheless relevant today. What drew me to finally read it was the one or two comments on this blog referencing it as having helped in dealing with RSI, coupled with a previous awareness of the book a few years ago. The book is about a condition that Dr Sarno calls TMS (Tension Myositis Syndrome) which describes how there exists an ability in one’s mind (unconcious) to restrict the flow of blood (causing mild oxygen deprivation) to tired or injured areas which in turn causes those areas to stay continually sore, weak and painful (although not permanently damaged). The author states that the mind wants to create the pain as a distraction from other emotional/psychological conflicts or trauma that exist in the unconscious and have been repressed, perhaps things that happened a long time ago (eg as a child). If the issues in the unconscious mind were allowed to come forth, there would be an emotional mess in the concious mind. The unconscious mind therefore keeps a lid on these issues, and diverts one’s attention with pain which is focused on the body as opposed to the mind. “The role of pain was to divert attention from frightening feelings” , as he puts it. He states that it is only after confronting these issues, and accepting that you have emotional issues (“inner rage”, as he calls it) that need to be brought into your conscious and dealt with, that you can finally get over the masking symptoms, ie your pain. He attributes this process to causing all kinds of pain including back, neck and shoulder pain, as well as RSI conditions, other myofascial pain type conditions, back pain, and many others ranging from sciatica to tennis elbow and even cancer. Dr Sarno also claims that the experience of continual pain can lead to the creation of an ‘inner rage’ which can be self-fulfilling, causing more pain. In his experience, the people who are more susceptible to this are the more conscientious workers who always strive to do their best in their jobs and life (ie perfectionists). This compounds their inner rage because it is impossible to live up to their own expectations of themselves. I can also admit to somewhat fitting this psychological profile. He claims that treating this type of condition physically (eg via physiotherapy) is a waste of time and that any benefit is purely a placebo effect. He recommends that firstly you need to accept that there is a psychological basis for your pain, that your body is not abnormal but is just being unconsciously made to feel abnormal . You should then identify all pressures in your life (old and current) that could contribute to ‘inner rage’ and deal with them consciously to reduce their possible negative effect in the unconscious. He says that accepting that your pain can be caused by the unconscious, and that it is nothing more than a distraction to your inner rage, can lead you to actually allowing your unconscious to release more blood flow to the injured (or painful) parts of your body and allow healing to take place and the pain to subside. This process can actually take place very quickly once you have established and realised the psychological basis of your pain. He does acknowledge that his views are far removed from mainstream medicine and clearly states that, “… mainstream medicine has yet to acknowledge the process whereby strong unconscious emotions can induce physical reactions”. So where do I stand with this view? Well let me start by saying that Dr Sarno’s work is very well researched with lots of examples in his book and I certainly have no reason to doubt his findings. Indeed I have long stated that RSI is partially a psychological issue (but primarily a physical one). He does, however, flip this viewpoint around, albeit pointing out a psychological mechanism for creation of the physical pain (restricted blood flow to injured areas, controlled by the unconscious) as opposed to just purely imagining you are in pain. It has certainly led me to reassess my condition and review it from all angles and not to rule out the possibility of having inner stresses causing the restriction of blood flow into my injured arms. I am convinced that the human mind (both conscious and unconscious) does work in many mysterious ways, and wouldn’t rule it out as a potential cause. You certainly have to be prepared to open your mind to any possibilities with RSI, especially as I can concur that addressing the symptoms physically has done no long term good for me. I do recognise, however, that we as humans are all made differently and, as a result, we will respond to a (TMS) mindbody approach differently. In the case of RSI, whatever you find that works is indeed the best solution for you and, let’s face it, the (TMS) mindbody option costs a whole lot less than endless physical treatments. If I achieve any results with this approach you will be the first to hear about it, in the mean time, it may be worth giving it a try…..
Anxiety and stress are cumulative. There is the straw that breaks the camels back and gives it the back pain or RSI or other maladies that happen. Dr. Sarno’s approach is an effort to update the studies of Dr. Abraham Low, Dr. Claire Weekes and others who recognize the effects of anxiety and stress. The muscles and nerves and bodily organs effected are always the same. Dr. Sarno’s contribution lies in the very clear explanation of the spine. It is no delicate thing and has served humans for millions of years. In the last fifty years we have been able to peer inside and see the normal deformities of aging, such as “slipped discs”. Seeing an image of a deformity in your body is a powerful and frightening thing. I know. I’ve been there. Discounting it is sometimes very hard. The same goes for RSI problems. Sometimes imaging or testing will show some type of bodily deformity, which is more or less normal. This said, when a person has been cramped up or guarding or in pain (yes, the pain is real) for so long the body structure changes. Here is the weakness in the Sarno books. Okay, what I’ve got is psychogenic, accepted, but just knowing that does not take away what to do about real stiffness and problems caused by bracing and guarding or atrophy. Gradually, you can become aware of various muscles again through calming down, but sometimes approaching your body in co-ordination with your mind can help. For instance, if you look into the work of Thomas Hanna (Somatics) you will find a very similar diagnosis to Sarno as to why you are in the shape you are in, based on emotions, and he outlines some movements (not exercises) to reshape what he calls sensory amnesia. When your body had been one big paincicle, it is difficult to feel the individual muscles and movements. Another helping hand is through meditation, which has been shown to reduce the lactic discharge of chronically tensed or hypotonic muscles. I have read many accounts on the TMShelp.com web site that deals with RSI. Positive re-enforcement is necessary, and reading the success stories there and on the TMS Wiki are certainly helpful. I can certainly relate to what you say about the longevity of the injury having given rise to different structure and atrophy which can’t be mentally fixed alone having had the injury for 16 years its pretty well ingrained physically by now. I do think you are right about the two sided approach where we all calm down the mental stresses eg by rationalising them, confronting them, coupled with with some meditation to get back in control of them whilst also addressing any lingering physical problems that may be present. Perhaps people with less exposure to RSI say less than 2-5 years can find help in losing the condition with the mental approach alone, but it sure doesn’t do any harm calming the mind down at any stage of your injury cycle. I’m now certain that while my pain is physically caused by tense muscles and compressed nerves (primarily upstream in my neck and head, which in turn somehow tenses up the rest of my body), the cause of this tension is a reflection of what could be called chronic mental tension. Much like how when you’re stressed, that can be reflected in hunched shoulders, or if you keep trying to finish a task when you know it is irrational to continue, your body might tense up. I’m skeptical of the precise mechanism Dr Sarno describes, but it set me on the right track of taking a psychological approach to tackle the root of my problem. Reflecting on some passages, trying to feel unrestrained rage without focusing too much on specific life details, I sometimes felt a physical relaxation and reduction in pain, which suggested that I was vaguely on the right track. I feel like I’ve wasted the inital few years of my RSI taking a purely physical approach, which never gave lasting benefits. I’m also very skeptical of the new age-y elements of Michael Brown’s book, but this too was a useful framework to progress further in understanding why my mind makes life difficult for myself. Even after reading these books 2 years ago, it’s only now that I’m starting to realise how radically I need to change how my mind works and how I think about things if I’m really going to overcome this condition. On the few occasions where I’ve managed to achieve such a mental state, my body has dramatically relaxed, the pain in my forearms and elsewhere releases considerably, and I am certain that it is a response to the release of mental tension. When I say that I found I need to radically change how my mind works, I mean questioning not just my most basic thoughts and feelings about things, but the experience of thinking as a whole. It’s hard to explain such a subjective experience! It feels like my mind has operated in a small box, and I find that I’m actually in a much bigger room, and an accompanying feeling of freedom from anxieties, compulsions, and so on. I don’t know if this is the right approach for most sufferers, but I now feel genuine optimism because I’m sure I’m on the right track. An insightful post. As you may have read I do believe that there are both physical and mental elements to RSI. I occasionally found that my RSI pain during work would vary depending on whether I had a really interesting task that I really wanted to do or one that I dreaded. I still had RSI pain later in the day irrespective of which I did, but during the day I could definitely be more relaxed when working on something I enjoyed doing. I also found that reducing symptoms after a day at work related to relaxing everything including the mind. Once the mind relaxed, the arm tension eased just enough to get some relief. Hence the reason some therapies for relaxation like massage, contrast baths, meditation, distraction etc can be very useful to combat RSI. I didn’t try like Dr Sarno suggests getting angry with myself at the time, but I’d add that in too. There are the physically injured muscles that need addressing too, but stage one in the process has to be getting the patient to relax and calm down. I also remember that just the thought of what was ahead in a day full of clicking and typing could be enough for RSI pain to start. It was just my body tensing up at the thought, tightening those injured muscle tissue to the point of pain. Mental relaxation is definitely part of the RSI pain cycle. « Put your phone down!